Oh my GOSH. You guysssss. So. You know how I have this food blog where I do weird things like take pictures of food in my dining room and then tell you how OMGamazing it is and that you must must must make it right right now? Like every single day? Well. This is no exception. Slow cooker hot chocolate: HELLO! Um, also? Pictured above is a perfect example of how I cannot follow instructions. Apparently “open other end” means “open whatever end you feel like because you never pay attention.” Pretty sure most of my previous teachers would agree that I rarely followed directions. Hate it. Bah. Anyway. I am pretty much dying. This is the creamiest, thickest, richest, most luxurious hot chocolate I have ever tasted. Now I know what people mean when they talk about “sipping chocolate.” This is actually like sipping melted chocolate. MELTED freaking chocolate. I mean, seriously. You are practically drinking melted chocolate. Should I maybe say it a fourth time? Hmmmm. I’ve been obsessed with the idea of coconut hot chocolate ever since Katie shared some coconut fudgesicles this summer. But, you know, I loooooathe being hot, like to point that you would absolutely hate my guts and think I was the worst human on the face of the earth if you had to spend more than 15 minutes with me outside in the blazing sun in about 85-degree weather… so obviously I could not make this beautiful beverage until there was a chill in the air. This is huge because I don’t even LIKE hot drinks. I really am not a fan of any warm liquid sliding down my esophagus and it feels so unsettling in my stomach. Yeah, laugh it up. I’m sorry. It just makes me feel so… so… yuck. I will probably consume a hot beverage or two that contains the words “peppermint” and “mocha” this season, but just a few. And when I say a few, I really mean about half of one or two. For me, I want iced all the way. Total weirdo. 23 degrees and an iced latte, pleaseandthankyou. So not only is this drink made with real coconut milk, chopped dark chocolate and cocoa, the mugs are rimmed with crushed toasted coconut. It’s complete with some of your favorite marshmallows and a a big puff of coconut whipped cream plopped right in the center, but I wouldn’t hate it if you added a little Baileys or Kahlua or whatever. Can you even think of anything better? Oh wait. I can. You made it in your CROCKPOT. Pour, stir, done. Yield: 8 to 12, can easily be cut in half, doubled, etc. 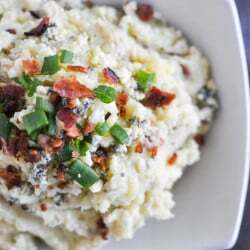 Add coconut milk, condensed milk and extracts to your crock pot, whisking to combine. Stir in salt, cocoa powder and chocolate, whisking again. Cover and cook on low for 2 hours. You want to stir and whisk every 15 minutes or so, making sure the chocolate melts nicely and is thoroughly distributed throughout the mixture. The best thing I can say here is to “know” your crockpot. I knew that mine could sit on low for a few hours while being mixed at least once every 30 minutes. After a while it began to thicken and bubble on the sides, so I left it on but removed the lid and whisked well. Just keep your eye on it and whisk everything together. Before serving, add coconut to a small saucepan and heat over low heat, stirring with a wooden spoon. Toast for 5-6 minutes until golden. Let cool, then add to a paper or ziplock bag and crush with you hands under small flakes remain. To serve, rim the edges of a mug with some frosting or glaze or something sticky, then dip the rims in the toasted coconut flakes. pressing gently to adhere. 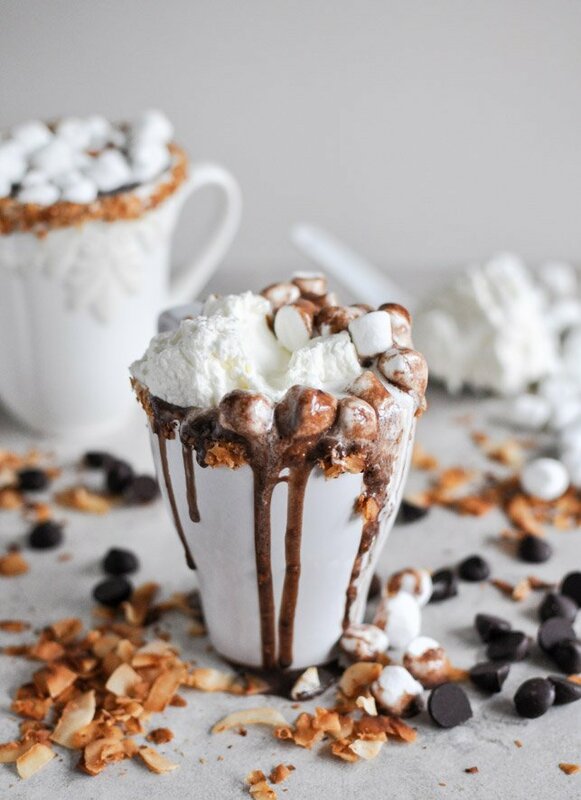 Pour hot chocolate in the mugs and garnish with whipped cream and marshmallows. Now that’s worth it. Add it to your menu. Wow, this looks like a great drink. Too bad the writing makes me want to punch the other (and myself) in the face. This recipe looks sooo delicious. Perfect for family Christmas get togethers! Question: do you think that I could use almond milk instead of sweetened condensed milk so my husband can drink it? (He’s lactose intolerant) or do you think that would alter the taste too much? So I am vegan and was looking at veganizing this. I don’t think almond milk would work because the texture is too thin. I would recommend either soy or coconut creamer due to the the thicker texture, and I would do sweetened for sure, sweetened vanilla if you can get it. In lieu of that, coconut milk would be closer in texture than almond milk, again because it’s thicker. Maybe try the So Delicious Coconut Milk Nog. Those are the two alternatives I’m going to try, the Nog and the creamer. Hope that helps! I recently found sweetened condensed coconut milk at Whole Foods in the baking aisle. Haven’t tried it yet but might be worth checking out. I’m sure you can find it other places than Whole Foods, too. Does anyone know what sized croc pot this recipe is made for? Wow! I want this!! I was googling coconut coffee recipes and your cocnut hot cocoa came up! I don’t have coconut for the topping, but I do have all the rest, thanks for sharing, I will pin this!! I made this Sunday morning. It tasted like a chocolate bar in a mug. Yum! I tried this at a family occasion, and made it once myself. It’s amazing for large gatherings, since the crockpot can keep everything warm. If you have leftovers at the end of the evening they have usually cooked down enough to be refrigerated as an amazing chocolate mousse. I will definitely make again, especially for the mousse. My kids is going to love this recipe.